Tyshon Judge of Paul VI High School drives to the basket past D.J. Campbell (left) of Vineland High School during the 42nd annual Carino Club South Jersey High School All-Star boys basketball game at the Rutgers Camden. First, Carl Gibson hit a deep three-pointer. Then D.J. Campbell hit a deeper three-pointer. Then Campbell buried one from the base of the Ben Franklin Bridge. Not to be outdone, Gibson drained his seventh three-point of the game, a nothing-but-net splash from the left corner. Ryan Ems (center) of Eastern High School reaches for the basketball against D.J. Campbell (right) of Vineland High School and Charles Solomon of St. Augustine Prep during the 42nd annual Carino Club South Jersey High School All-Star boys basketball game at the Rutgers Camden. Gibson, a guard from Cherry Hill East, scored 23 points and was named Most Valuable Player of the black-shirted West Squad. Campbell, a guard from Vineland, made five three-pointers and scored 19 for the grey-clad East squad. St. Augustine forward Charles Solomon was named MVP of the East team, which emerged with a 123-114 victory at Rutgers Camden. School teammates Tyshon Judge (17) and Hartnel Haye (15) of Paul VI combined for 32 points for the West squad. Campbell and Gibson had a friendly duel going midway through the second half. It was a continuation of a battle that began when Cherry Hill East bounced Vineland out of the first round of the South Jersey Group 4 tournament, ending Campbell’s career. “I wanted to get him back for what happened in the playoffs,” Campbell said. Both players were raining three-pointers. Gibson, who has drawn recruiting interest from West Chester (Pa.) University among other college programs, made three treys in the first half and four more in the second half. The 6-foot-7 Solomon dominated in the paint along with teammates Jacob Valeus from Pleasantville and Zion Teague from Atlantic City. Valeus scored 15 and Teague 10. But Campbell broke the game open for the West squad with a flurry of four three-pointers that began with around eight minutes remaining in the game. Mattia Morini of Bishop Eustace Prep dunks the basketball during a slam-dunk contest before the 42nd annual Carino Club South Jersey High School All-Star boys basketball game at the Rutgers Camden. Mattia Morini of Bishop Eustace and Mike DePersia of Haddonfield, both members of the West squad, won contests held in conjunction with the game. Morini won the dunk contest and DePersia won the three-point shooting contest. The Black team won the Tim Lenahan Memorial Eighth-Grade Game by a 70-59 score as Collingswood Middle School’s Tim Search was named MVP. Semaj Bethea of Kipp-Norcross Camden school was named MVP of the Gray squad. Gray teamer Ayden Hagan, of Gateway Middle School, won the three-point contest. Mattia Morini of Bishop Eustace celebrates winning dunk contest with Moorestown's Nick Cartwright-Atkins (right). E: Kyree Myers 2, Javon Gordon 10, William Piollick 4, Josh Wright 7, Darnell Demby 4, Sean Miller 8, D.J. Campbell 19, Marcellus Ross 8, Steve Matlack 8, Jacob Valeus 15, Charles Solomon 28, Zion Teague 10. 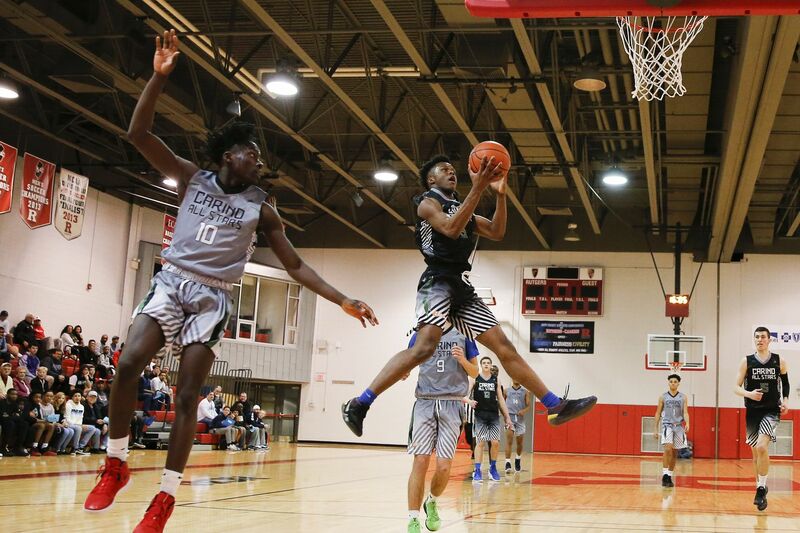 Eest: Mike DePersia 4, Dorien DePina 5, Tyshon Judge 17, Nick Cartwright-Atkins 7, Brian Burns 3, Carl Gibson 23, Baba Ajike 7, Conor Regan 8, Mattia Morini 7, Ryan Ems 1, Uche Okafor 11, Hartnel Haye 15, Dan Fleming 6.